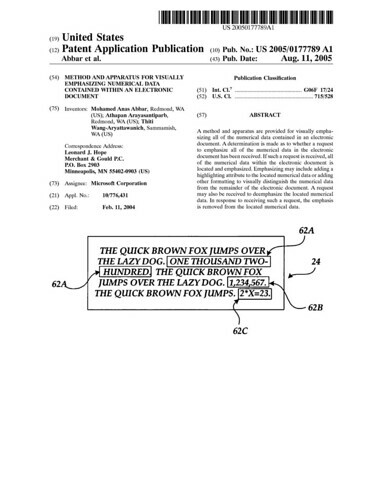 Microsoft is attempting to patent the highlighting of numbers by drawing boxes around them. Read the abstract and weep: "A method and apparatus are provided for visually emphasizing all of the numerical data contained in an electronic document. A determination is made as to whether a request to emphasize all of the numerical data in the electronic document has been received. If such a request is received, all of the numerical data within the electronic document is located and emphasized. 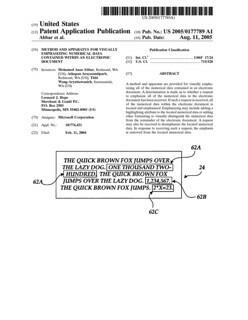 Emphasizing may include adding a highlighting attribute to the located numerical data or adding other formatting to visually distinguish the numerical data from the remainder of the electronic document. A request may also be received to deemphasize the located numerical data. In response to receiving such a request, the emphasis is removed from the located numerical data."